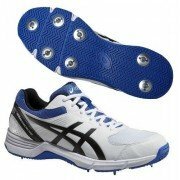 Asics offer a large range of cricket shoes and trainers here at All Rounder Cricket and have long been the leading supplier of cricket boots to cricketers around the world and also netball trainers and hockey shoes. The GEL-220 Not Out is a supportive all rounder shoe designed to be capable of taking the strain of fast bowling. Constructed on a Solyte Lasting 55 midsole for a soft but stable platform feel, this shoe features Dynamic DuoMax to enhance support and stability. The GEL-220 Not Out has a midfoot Trusstic to provide greater arch support and torsion stability while rearfoot and forefoot GEL units attenuate shock. The upper has also been engineered using kangaroo leather to provide superior comfort feeling like trainers. The range caters for all cricketers including specific batting shoes, bowling boots, netball trainers and shoes that offer an All Rounder great support as well. The Asics trainers are available from UK size 1 all the way up to size 14 allowing cricketers with large feet to benefit from Asics support and technology. Buy Now at All Rounder Cricket Store or purchase Asics Netball Trainers from our Sister Store.